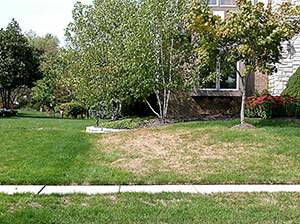 Chinch bug damage to lawns can range from subtle to dramatic, resulting in brown turf that can be confused with drought stress or leaf spot disease. Here, David J. Shetlar, Ph.D., professor emeritus of urban landscape entomology at The Ohio State University, offers some recommendations for how you can ID and control a chinch bug infestation. Identify the culprit. Chinch bugs are generally small black and white insects. Early instar nymphs are a bright orange color with a white band across the abdomen, and later instar nymphs turn a dark purple-black color. Southern chinch bugs look like hairy chinch bugs; a specialist is needed to separate the two species. Hairy chinch bugs are most common and damaging in cool-season grasses in the Northeast. The western chinch bug seems to attack lawns in the prairie states. The southern chinch bug is most common in all of the Gulf states, especially where St. Augustinegrass grows. Hairy chinch bug damage in cool-season grasses looks like melting out from leaf spot disease or summer drought stress. Shetlar says that lawn care operators (LCOs) often mistakenly believe the turf damage is caused by an irrigation head that isn’t working properly. Diagnosing the problem. Shetlar recommends that LCOs get down on their hands and knees where the turf looks droughted and brown. In the areas where brown turf meets green turf, separate the canopy, and if there are chinch bugs, they will be running around in the thatch zone. Damage control. “Hairy chinch bugs respond well to a single application of a pyrethroid insecticide,” Shetlar says. The southern chinch bug has up to six generations per year, so repeated applications in a single season of several insecticide categories can lead to resistance development, especially with pyrethroid and neonicotinoid insecticides. However, combination products containing a pyrethroid plus a neonicotinoid perform well against resistant southern chinch bugs. LCOs can limit their applications to once a year for an insecticide category to avoid resistance. Long-term strategy. Chinch bugs are often found in neighborhood developments, Shetlar explains. He says this is most likely because the developer used the same turf supplier or seed source to establish lawns. Kentucky bluegrass is extremely susceptible. Perennial ryegrass and fine fescue lacking endophytes are also highly susceptible. In turfgrasses, endophytes are fungi that take in nutrients and water from the grass plant. In return, endophytes produce toxins that protect the plant from various insects, especially caterpillars, chinch bugs and billbugs. Fescues and ryegrasses with endophytes are resistant to chinch bug attack. When reseeding lawns with chinch bug damage, Shetlar recommends consulting with seed suppliers to establish endophytic grasses into lawns. Another option is to check with local turf suppliers and obtain new cultivars that have shown resistance to southern chinch bugs.